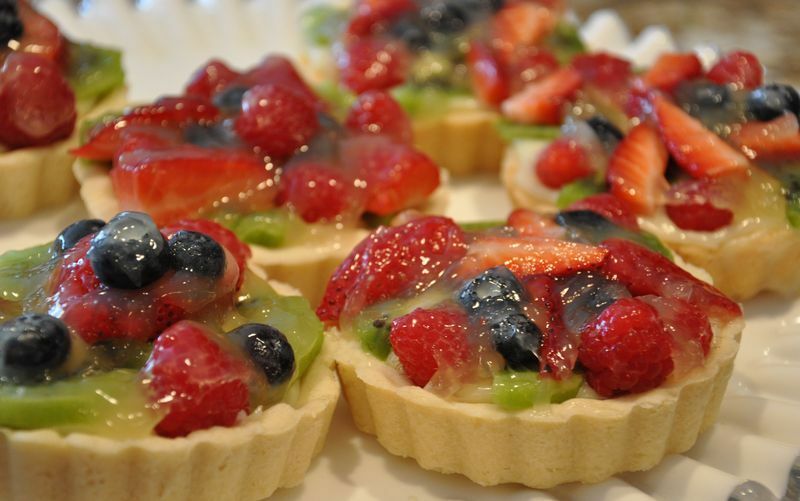 This is how it looked as mini tarts. Crust: Heat oven to 300 degrees. Beat butter & confectioner's sugar until light & fluffy. Blend in flour. Press mixture onto bottom & up side of 12 in. round tart pan. Bake 20-25 minutes or until lightly browned. Cool Completely. While it is cooling, prepare filling. Spread on cooled Crust. Cover. Chill. Prepare Fruit Topping. Cover. Chill assembled tart. Vanilla Filling: In microwave safe bowl, microwave vanilla chips & whipping cream at High 1-1 1/2 minutes or until chips are melted and mixture is smooth when stirred. Beat in cream cheese. Cool. Fruit Topping: In a small saucepan, combine sugar & cornstarch. Stir in juices. Cook over medium heat, stirring constantly, until thickened. Cool. This is absolutely delicious. 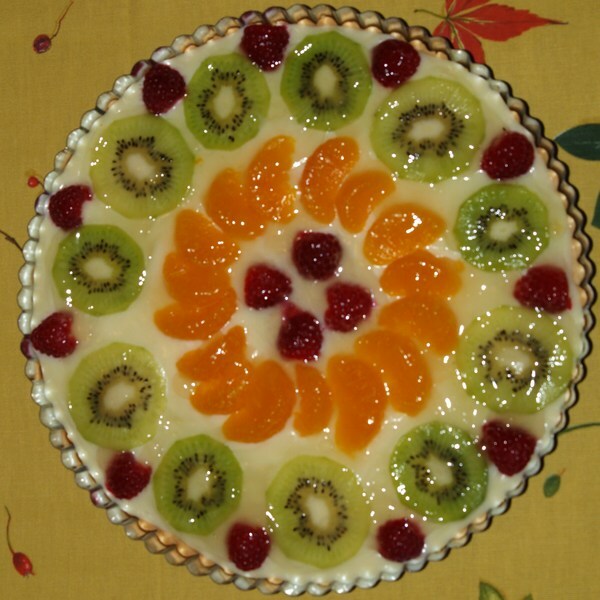 It taste fresh and tart but also very rich and fulfilling. You will not be disappointed! Nancy, this was so good! It looked spectacular and it was so delicious. I'm definitely going to make it. I made this today and thought not only was it beautiful but delicious! The crust is perfect. I had to use a mini tart pan. I piled each one high with kiwi, rasberries, blue berries and strawberries. This would be great for company or a romantic dinner. Thanks for posting this recipe! Great cheese flavor combined with the fruit. Wonderful. We couldn't find vanilla chips at Lunardi's so we used white chocolate chips and I added 1 tsp of vanilla. It came out yummy! And beautiful! Everyone had seconds. I asked my daughter (16) to rate this recipe and she gave it 10 hearts even though she knew the limit was 5. It's a winner! 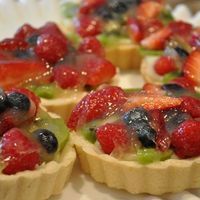 Making tarts is one of the things I like doing with my kid. Thanks for this. Beautiful and delicious. It was just as good the next day. Wow, this sounds delicious! 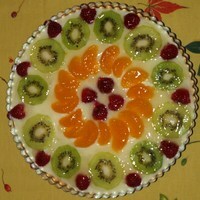 It reminds me of a fruit pizza recipe my friend makes. Can't wait to try it! Gluten Free Dumpling Delights! Sweets Without The Wheat!